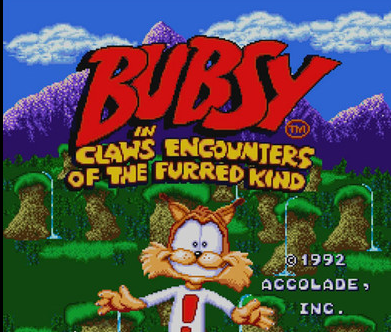 Bubsy Two-Fur is a compilation that includes the first two Bubsy games, Bubsy In Claws Encounters of the Furred Kind (1993) (better known as Bubsy 1) and Bubsy 2 (1994). 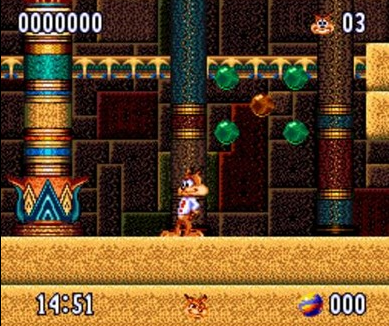 Bubsy is 2D platformer that has you playing as Bubsy the Bobcat. Bubsy has to stop the evil yarn aliens from taking over the planet, so he must traverse though extreme terrains such as: The desert, the carnival, green hills, all the way up to space. 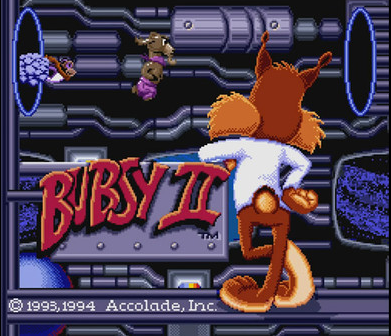 Bubsy 2 has you battling the evil yarn aliens once again but in much more challenging and much more diverse levels. He sure is a Bobcat with an attitude and some nostalgia appeal due to these being re-releases of old games but do these games still hold up today? What could possibly go wrong? (Click on "Read More" to read the full review). The story in these games are incredibly basic but it is enough to give you a reason to beat this game, it doesn't need all of the fancy story progression stuff found in more modern platforming games. The original Bubsy has incredibly simple gameplay, all you do is run and jump your way until the end of the level. What is/was unique about this game was that you get to glide around to either get to places or to break your fall, you will die from falling from high places. With that said, gliding is very useful in this game and you will be using it a lot. If you start walking in one direction then you'll gain momentum and start to run really, really fast. Gameplay in the original game is incredibly sluggish and hard to control and it felt like I was controlling a wet sponge but still, it is still a few steps above from being unplayable. 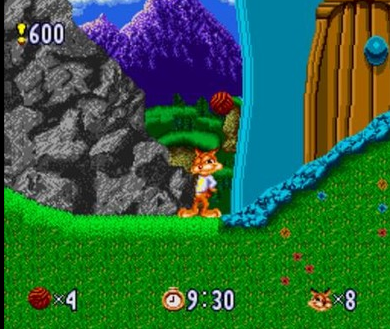 Bubsy has two kinds of jumps, a low jump and a high jump and you'll find yourself using the high jump the most due to it being the most reliable. Jumping on enemies can be very tricky, you have to be very exact on jumping on your enemies otherwise you will die. Another annoying thing about the enemies is that they can show up without warning and really makes your super speed useless as it is far too risky to use and that's a shame as it isn't a bad ability. 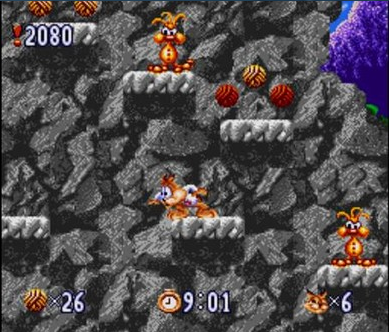 Gameplay is also very unoriginal, we have seen this kind of gameplay done much better than this with games such as Sonic the Hedgehog (1991), Jazz Jackrabbit (1994), and Superfrog (1993). Gameplay is also unoriginal in the bad way as the familiarity of it all will make you grow bored with this game quite quickly and this by all means is not a short game, so to be fed up with it before it really gets started is a very bad sign. This game is also very challenging but very beatable, especially since how this game has passwords to get to later levels and a save state system that's new to this version of the game and was introduced with this release. The default control lay out is very frustrating due to how awkward the position of your fingers will be, just be glad that you can reconfigure the keys to a more comfortable position. Going back to the topic of being bored with the game before it is started, you aren't really missing much as most of the levels are very generic and uninteresting and run for much longer than they needed to be. The graphics themselves aren't very bad, they have some memorable character designs, nice use of colors, and some nice detailing. Most of the music is very bland and generic and isn't worth paying attention to, however this game does have some decent tracks included and I especially liked the carnival theme. This game has some voice acting in the form of one liner quips and it was surprisingly very crisp and clear but the dialogue itself is very hit or miss due to the annoying portrayal of them. You like puns? This game is full of them and they aren't very good, you'll have a hard time trying to stomach them down. Overall, the first game is incredibly mediocre and is full of very dull and unoriginal things but this game has also aged better than a lot of the other generic and unoriginal platformers and is still playable. The second game is a huge improvement over the original with the first improvement being the gameplay. The gameplay is much tighter, it is much more responsive and doesn't feel laggy or slapped on one bit. While an improvement, it is still very dated compared to a lot of other platformers out there but is still very playable. The gameplay is also more varied, you are not only running and jumping, you are also able to fly a plane and flying a plane was pretty fun in this game but not instantly fun as I found getting used to controlling around all of the crowded scenery to be a little frustrating at first. The levels in Bubsy 2 are also very interesting and are packed with classic movie themes such as Robin Hood, cheesy sci-fi, b-grade adventure, and intense war themes that take place in the sky. This game also has an over world to where you can select which level that you want to go to. The levels and themes give this game some flavor unlike the generic and bland levels found in the original. I did have some problems with the level design though, they were incredibly crowded with enemies and I could've used some breathing room. There is an upside to the levels being crowded and that is that you'll be able to know what to look for unlike in the first game. My other problem is that they can also be a little confusing to travel and what you can and can not touch is a bit unclear. Bubsy 2 is also very hard and has a good challenge but unlike Bubsy 1, you will want to try and beat the game as the challenge is more fun with this one. Yup, this game is also full of puns that are so bad, it makes my jokes sound funny and my jokes aren't funny. Graphics in this game aren't much different than what is found in Bubsy 1. 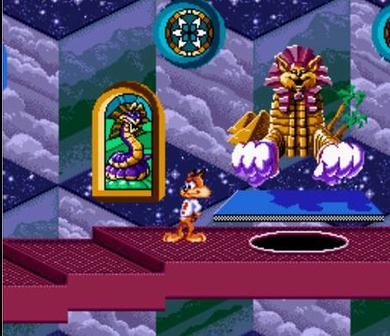 Bubsy 2 uses the original Bubsy sprite but the only difference is that there are a lot more things crammed into the foreground and background and I both liked it and disliked it. I liked how the new art gave this game more of a lively atmosphere but it did make the game a bit too overcrowded. Animation in this game is decent and is of the same quality of the first game. Music in this game was okay, it had its moments but there isn't a lot of memorable stuff to be found and a good chunk of the soundtrack is very generic sounding. This game does have voice acting in it and it is just as like it or lump it as in the first game. While Bubsy 2 is a huge improvement over the original, it is also the biggest problem with this collection due to it being one of the most poorly emulated official releases that I have ever seen. Bubsy 2 will play for a little bit but it will then suddenly freeze and make annoying sounds, so it is an unplayable mess of a port and should really be fixed up. I am unable to beat this game because of that problem and this is a game that got me really hooked in. Does the original Bubsy suffer from these bad emulation problems? No, it runs fine and is perfectly playable but getting this release for both games and having only one of them work really defeats the purpose of getting this collection. Overall, this collection would've been an interesting thing to have in your gaming collection if it weren't for the first game being incredibly dull and boring and the much better second game being terribly ported. I'm not going to recommend that you go out and get this collection, well, not in this state anyway. If this game were to have a patch that fixed the second game then it'd worth considering. On the bright side, at least this collection doesn't have Bubsy 3D (1996) in it and I'd much rather the broken Bubsy 2 port over that abomination.